Added by Debra Tash on June 7, 2018. Three crew members are on their way to the International Space Station after launching from the Baikonur Cosmodrome in Kazakhstan at 7:12 a.m. EDT Wednesday (5:12 p.m. Baikonur time). 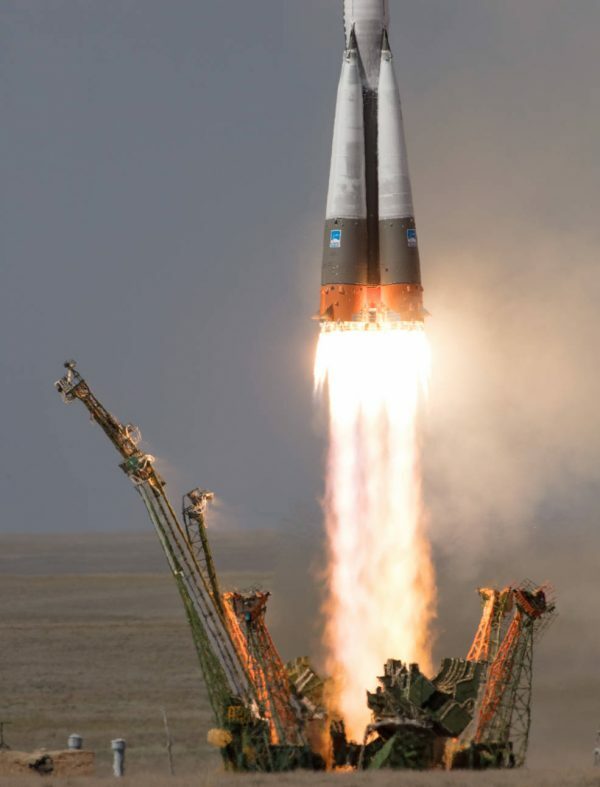 The Soyuz spacecraft carrying Serena Auñón-Chancellor of NASA, Alexander Gerst of ESA (European Space Agency), and Sergey Prokopyev of the Russian space agency Roscosmos is scheduled to dock to the space station’s Rassvet module at 9:07 a.m. Friday, June 8. Coverage of docking will begin at 8:15 a.m. on NASA Television and the agency’s website, followed at 10:30 a.m. by coverage of the opening of hatches between the spacecraft and station. The arrival of Auñón-Chancellor, Gerst and Prokopyev will restore the station to six crew members. They will join Expedition 56 commander Drew Feustel and flight engineers Ricky Arnold of NASA and Oleg Artemyev of Roscosmos. The crew will spend more than five months conducting about 250 science investigations in fields such as biology, Earth science, human research, physical sciences and technology development. Feustel, Arnold and Artemyev are scheduled to remain aboard the station until October, while Auñón-Chancellor, Gerst and Prokopyev are slated to return to Earth in December. This crew continues the long-term increase in crew size on the U.S. segment from three to four, allowing NASA to maximize time dedicated to research on the space station. Highlights of upcoming investigations include a new facility to study ultra-cold quantum gases, the first commercial European facility to conduct microgravity research, and a system that uses surface forces to accomplish liquid-liquid separation. For more than 17 years, humans have lived and worked continuously aboard the station, advancing scientific knowledge and demonstrating new technologies, making research breakthroughs not possible on Earth that will enable long-duration human and robotic exploration into deep space. A global endeavor, more than 230 people from 18 countries have visited the unique microgravity laboratory that has hosted more than 2,400 research investigations from researchers in more than 103 countries. Get breaking news, images and features from the station on Instagram and Twitter. This is the first spaceflight for Auñón-Chancellor, who was selected as an astronaut in 2009, and she is the 61st woman to fly in space. Learn five things you may not know about Auñón-Chancellor in a profile video and an interview on Houston We Have a Podcast.